Who took the square root of infinity. Did Einstein ever say “biggest blunder”? Astrophysicist and author Mario Livio publishes a new book Brilliant Blunders. George Gamow reports about Einstein telling him: “Einstein’s original gravity equation was correct, and changing it was a mistake. Much later, when I was discussing cosmological problems with Einstein, he remarked that the introduction of the cosmological term was the biggest blunder he ever made in his life. But this ‘blunder,’ rejected by Einstein is still used by cosmologists even today, and the cosmological constant denoted by the Greek letter Λ rears its ugly head again and again and again. (Gamow, George My World Line, 1970, Viking Press, pp. 149-150; see quote in Janssen below). In his new book “Brillianat Blundders”, Livio doubts that Einstein said “biggest blunder” to Gamow. Livio can find no documentation that Einstein said this. Instead, claims Livio, all references eventually lead back only to Gamow, who reported Einstein’s use of the phrase in two sources: his posthumously published autobiography My World Line (1970) and a Scientific American article from September 1956. Yet from the reported evidence Livio was unable to demonstrate that Einstein have never uttered the phrase “biggest blunder.” See reference here. And here. In an interview with Livio, reporter of the Atlantic writes that Livio “looked at almost every single paper that Einstein ever wrote” including making a trip to the Einstein archive in Jerusalem to look at the collection personally. “And nowhere did I ever find the phrase ‘biggest blunder’” said Livio. Already in 1999 John Stachel told the authors of this paper that “The comment [‘biggest blunder’] doesn’t appear in Einstein’s writings”. The phrase “biggest blunder” perfectly suits Einstein’s sense of humor. “I am writing you now about a scientific matter that electrifies me enormously. I have come upon a logical contradiction of a quantitative nature in the theory of gravitation, which proves to me that there must be a calculational error somewhere within my framework”. Einstein spoke about “a blatant contradiction” [ein flagranter Widerspruch]. Einstein asked for help from Freundlich: “I do not think that I myself am in the position to find the error, because my mind is locked in the same rut in this matter. Rather, I must depend on a person being with unspoiled brain matter to find the error. If you have time, do not forget to be occupied with the topic”. On November 28, 1915 Einstein wrote Arnold Sommerfeld: “I realized, namely, that my existing field equations of gravitation were entirely untenable! […] This showed that covariance with respect to ‘adapted’ coordinate system was a flop [ein Schlag ins Wasser war]”. And Einstein explained to Sommerfeld: “Once every last bit of confidence in result and method of the earlier theories had given away, I saw clearly that only through a link with general covariance theory, i.e., with Riemann’s covariant, that a satisfactory solution could be found. Unfortunately, I have immortalized the last error in this struggle in the Academy-papers, which I can send to you soon”. On April 8, 1915 Einstein wrote Tulio Levi-Civita: “Hoch geehrter und lieber Herr Kollege!” In a long an tiering correspondence with Levi-Civita Einstein stubbornly tried to save his limited covariant gravitational tensor. Einstein was hard to give up, but then finally wrote his “Kollege” Levi-Civita: “My proof of the invariant nature of ΔJ fails with such infinitesimal transformations”, (which he called the sorest spot) “in which the gμν‘s of the original system are constant, because then the quantities Aμν cannot be chosen freely, but vanish altogether”. Abraham Pais translated this in the following way (Subtle is the Lord, 1983, p. 288): “If there is no quasi-static world, then away with the cosmological term”. Postcard to Herman Weyl. Archives ETH, Zurich. “I must admit that these arguments do not appear to me as sufficiently convincing in view of the present state of our knowledge. The introduction of such a constant implies a considerable renunciation of the logical simplicity of theory, a renunciation which appeared to me unavoidable only so long as one had no reason to doubt the essentially static nature of space. After Hubble’s discovery of the ‘expansion’ of the stellar system, and since Friedmann’s discovery that the unsupplemented equations involve the possibility of the existence of an average (positive) density of matter in an expanding universe, that introduction of such a constant appears to me, from the theoretical standpoint, at present unjustified”. Indeed Einstein’s main object in the 1916 general theory of relativity was to develop a theory that the chosen path entered to it was psychologically the natural one, and its underlying assumptions would appear to have been secured experimentally. Einstein abandoned his cosmological constant when he gradually understood that it was untenable; but did he say it was a blunder or his biggest blunder? In his paper “Mathematical theory of the origin of matter” Fred Hoyle describes cosmologists as “umpires” and he tells the following anecdote: “[Vesto Melvin] Slipher was the first important umpire. In effect, he had the temerity to give Einstein out leg before the wicket. A story tells us that Einstein did not enjoy the experience. For quite a while he glared at the umpire and even complained to the crowd as he walked back to the pavilion. When in later years Martin Ryle, dressed in the umpires white coat, somewhat joyously gave me out caught behind I did not hesitate to follow Einstein’s excellent example, and indeed a TV rerun of the situation has shown that the ball actually hit my boot not my bat”. In the same paper Hoyle also wrote about Gamow: “would shout from the other end: ‘the elements were made in less time than you could cook a dish of duck and roast potatoes”. Indeed Gamow was known of his sense of Humor. “Another important group of studies based on the general theory of relativity is presented by the work on relativistic cosmology, which is an attempt to understand the development of various characteristic features of our universe as the result of its expansion from the originally homogeneous state. This includes essentially the theory of the origin of atomic species, which presumably took place during the very early epoch when the material forming the universe was in highly compressed and very hot state, and the theory of the formation of galaxies which must have occurred during the later revolutionary period. The neutron-capture theory of the origin of atomic speciaes recently developed by Alpher, Bethe, Gamow, and Delter suggests that different atomic nuclei were formed by the successive aggregation of neutrons and protons which formed the original hot ylem during the early highly compressed stages in the history of the universe”. And in the footnote the reference appearing are: G. Gamow, Phys. Rev. 70, 572 (1946); Alpher, Bethe, and Gamow, Phys. Rev. 73, 803 (1948); R. A. Alpher, Phys. Rev. 74, 1577 (1948); R.A. Alpher and R. C. Herman, Phys. Rev. 74, 1737 (1948). However, it is possible that Einstein was fond of Gamow’s sense of humor. He owned Gamow’s humorous popular science books in his personal library. Gamow, George, Mr. Tompkins in Wonderland: or stories of c, G, and h, illustrated by John Hookham, 1940, New York : Macmillan. Gamow, George, One, two, three… infinity: facts & speculations of science, illustrated by the author, 1947, New York: Viking Press. “There is very little to say about my consultation work for the armed forces of the United States during World War II. It would have been, of course, natural for me to work on nuclear explosions, but I was not cleared for such work until 1948, after Hiroshima. The reason was presumably my Russian origin and the story I had told freely to my friends of having been a colonel in the field artillery of the Red Army at the age of about twenty. Thus I was very happy when I was offered a consultantship in the Division of High Explosives in the Bureau of ordnance of the US navy Department. After the business part of the visit was over, we had lunch either at Einstein’s home or at the cafeteria of the Institute for Advanced Study, which was not far away, and the conversation would turn to the problems of astrophysics and cosmology. In Einstein’s study there were always many sheets of paper scattered over his desk and on a nearby table, and I saw that they were covered with tensor formulae which seemed to pertain to the unified-field theory, but Einstein never spoke about that. However, in discussing purely physical and astronomical problems he was very refreshing, and his mind was as sharp as ever”. Livio discovered an article by a scientist: “I discovered a small article published in some obscure journal of the Navy by somebody named Stephen Brunauer,” a scientist who had recruited both Einstein and Gamow to the Navy. In that article, Brunauer wrote, “Gamow, in later years, gave the impression that he was the Navy’s liaison man with Einstein, that he visited every two weeks, and the professor ‘listened’ but made no contribution—all false [emphasis added]. The greatest frequency of visits was mine, and that was about every two months.” Clearly, Livio says, Gamow exaggerated his relationship with the famous physicist. It is not surprising. Einstein’s fame led people who knew him to write about their personal acquaintance with him. Brunauer was probably one of them… And indeed Gamow probably also exaggerated his friendship with Einstein. Einstein had a friend, a Hungarian Jewish physician named János Plesch. Jeremy Bernstein writes of Plesch autobiography, “indicates it was there that he began collecting people both as patients and friends. If we can believe his autobiography, he knew everybody”, and above all Albert Einstein. Plesch starts the chapter of his autobiography presenting Einstein with the following description, “Among the many scientific men who are, or have been, my friends there is one who out-tops all the others in stature, and that is Albert Einstein”. Yet Einstein told him many valuable typical Einstein anecdotes. How do we know whether Plesch’s reports are authentic or not? We cross-reference them with letters, unpublished talks, etc., written by Einstein himself! We know from Einstein’s own writings that it was typical of Einstein to tell his friends that he made errors and found blatant contradiction in his work. With his usual sense of humor, Einstein used to laugh about his difficulties in inventing the most beautiful and genius theory ever created: the general theory of relativity. It is possible that Einstein said something in German to Gamow, and the latter might have translated it to one of the classical apercus attributed to Einstein. 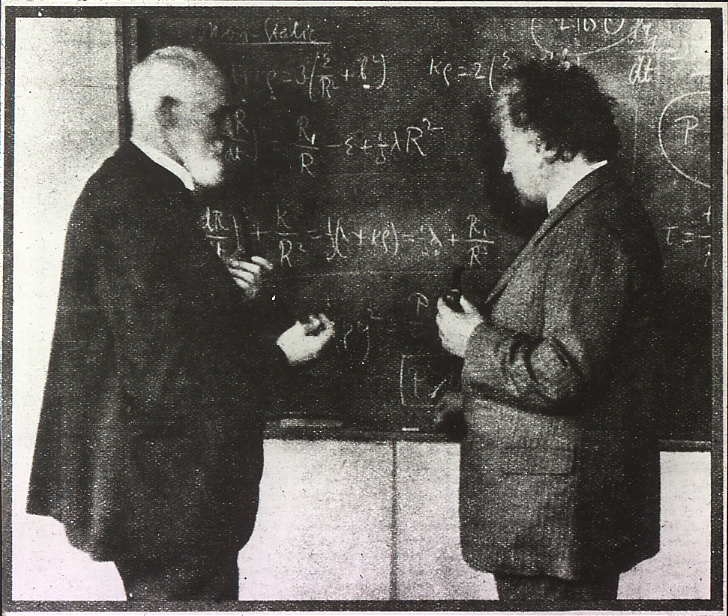 Albert Einstein and Willem de Sitter discussing the Universe. Michel Janssen, “Why Einstein Introduced the Cosmological Constant”. John Stachel, Einstein from B to Z.
Abraham Pais, Subtle is the Lord.